Colorado yoga clothing company, be present, celebrates its 10th anniversary this month. The company has been releasing twice yearly collections for the last 10 years since being founded in 2002.
be present has been one of the most generous companies I have worked with. The owners Jon and Amy have always been committed to doing good in the world as they style out yogis in cool clothes. Denver-based yoga clothing company, be present, has a lot to celebrate. This month marks its 10th birthday and the company is still going strong. Founded by husband and wife team, Jon and Amy Lopatin Dobrin, be present has been putting out seasonal collections for the last 10 years. It was founded in 2002 in Denver, Colorado when Amy produced the first designs for her brother’s Arizona yoga studio, At One Yoga. Running the business from the basement of their home, her and Jon grew the business enough to move into a larger space. As the collections evolved and more popularity grew for the line, they moved into an even bigger space where the company resides today. Since then, the company has adhered to its commitment to local and domestic production. “When we first started out, we decided to do our manufacturing in Colorado. It made sense - this is where we live. 10 years later we still have all of our production in the US (most of it here in Colorado), with the same cutters and sewers that made the first pair of be present pants,” says founder and designer Amy Lopatin Dobrin. With the celebration of its 10th year comes the release of a brand new logo. 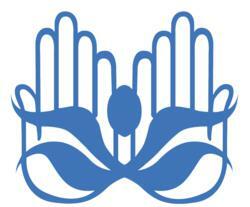 This new logo includes the original be present logo, held in the palms of two hands – each finger representing a year. It has the look and feel of a butterfly, floating from the cocoon and ready to bring in the next 10 years. This artwork is available on some of be present best selling eco-friendly tees for men and women for a limited time only. This includes the women’s Hangout Tee and Renew Raw Edge Long Sleeve as well as the men’s Organic Cotton Tee. be present is best known for it’s woven yoga pants. Their proprietary fabric, called Breathe Weave™ is a lightweight, quick-drying fabric with a modest amount of stretch. These styles are a unique in the yoga clothing industry as many yoga clothes are made with knitted fabrics rather than woven ones. This uniqueness has set be present apart, making the pants easily recognizable and remaining at the forefront of yoga pant styles. AcroYoga® co-founder Jason Nemer states, "be present has been one of the most generous companies I have worked with. The owners Jon and Amy have always been committed to doing good in the world as they style out yogis in cool clothes. They are always playing with new eco materials and their grounded ethics about people, relationships and the planetary web is one of the reasons be present is a global brand. I admire and support 100% what be present does and how they do it." be present, clothing for the yoga lifestyle, was established in Colorado in 2002 by Amy Lopatin Dobrin and Jon Dobrin. All be present clothing is proudly made in the USA. The brand remains at the forefront of the yoga apparel industry, continually designing clothing that is original and functional.